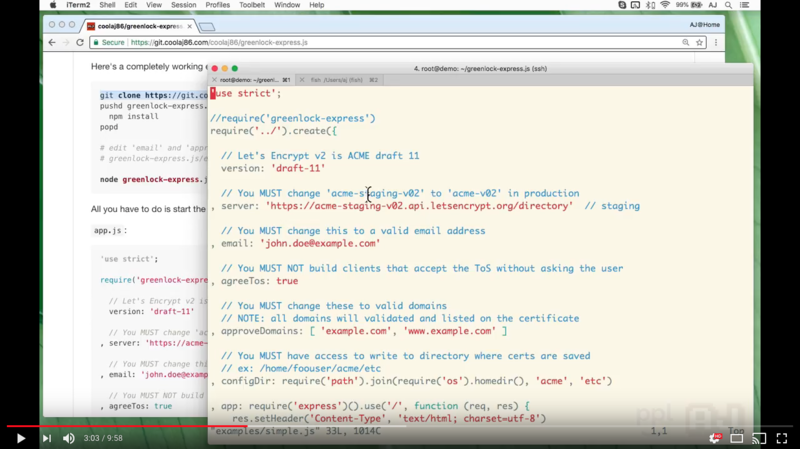 Greenlock works in the Commandline (cli), as a Web Server, in Web Browsers (WebCrypto), and with node.js (npm). Documentation for using Greenlock with http/https, Express.js, cluster, hapi, Koa, rill. If at first you don’t succeed, stop and switch to staging. I’ve implemented a “dry run” loopback test with self diagnostics so it’s pretty safe to start off with the production URLs and be far less likely to hit the bad request rate limits. However, if your first attempt to get a certificate fails I’d recommend switching to the staging acme server to debug - unless you’re very clear on what the failure was and how to fix it. Greenlock is built to incredibly easy to use, without sacrificing customization or extensibility. The following examples range from just a few lines of code for getting started, to more robust examples that you might start with for an enterprise-grade use of the ACME api. This works for most people, but it’s not as fun as some of the other examples. Here’s a taste of the API that you might use if building a commandline tool or API integration that doesn’t use node’s SNICallback. The full end-user API is exposed in the example above and includes all relevant options. If you are developing an le-store-* or le-challenge-* plugin you need to be aware of additional internal API expectations. Use v3.0.0 as your initial version - NOT v0.1.0 and NOT v1.0.0 and NOT v2.0.0. This is to indicate that your module is compatible with v3 (v2.7+) of node-greenlock. Since the public API for your module is defined by node-greenlock the major version should be kept in sync. v1.4.x I can’t remember… but it’s better! As the number of businesses using Greenlock commercially has increased, we’ve become more aware of the need for quick-turnaround support and licenses that allow for local private modifications. Currently we offer LTS support and commercial licensing models for IoT, On-Prem, and Web Hosting. Please contact us to learn more. Our trademark policy is pretty much “attribute, but don’t confuse”. Your users should understand that your product uses Greenlock and not be confused to think that it is Greenlock.